An apprenticeship can be incredibly rewarding for apprentices and business owners alike. For young people it can be the first step towards an amazing career. For business owners, employing an apprentice brings brand-new energy and potential to the team and the whole business. On Wednesday 6th March , we’re holding our How can an apprenticeship work for me? webinar. For this episode we’re bringing together business owners, apprentices and teachers to discuss why an apprenticeship may be right for you. So, to give us a feel for what to expect from the discussion, we asked one of our fantastic guest speakers a few questions about apprenticeships. 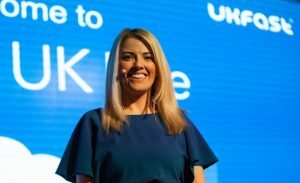 Here’s what school teacher turned UKFast director Arlene Bulfin told the UKFast Blog. Arlene, please tell us a bit about yourself. “I’m Arlene Bulfin and I’m a teacher and Director of People Development here at UKFast. Why are apprenticeships important for young people? “Apprenticeships give people the opportunity to learn while they earn. They’re gaining industry experience alongside completing valuable and relevant qualifications. As well as developing technical skills, they’re able to develop life skills that set them in good stead for the future. The ability to communicate effectively, collaborate with different teams in a business and work with people in your own team are just as important as role-specific skills. Why are apprenticeships important for businesses? Lastly, why should we tune into this webinar? “Getting involved with apprenticeships is a big decision to make, and as with all big decisions doing your homework is key! That’s why we’re addressing the advantages and the key points to consider so that viewers have all the information they need to make a really informed decision. Is an apprenticeship the right path for you? Discover all there is to know about apprenticeships in our UKFast Webinar!